Sprinkle our dehydrated Romano cheese powder onto popcorn, chips and other savory snacks, as well as steamed vegetables. Stir into pasta sauces, soups, casseroles, dips and spreads. Follow the recipe below for a quick and easy Alfredo Sauce. No refrigeration required! Stores and travels well - great for emergency food supplies, camping, boating, and RVing. Volume: 1 pound = approx. 4.21 cups. 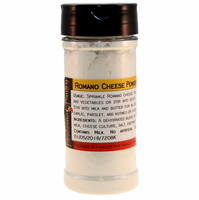 Ingredients: a dehydrated blend of Romano cheese (part-skim cow’s milk, cheese culture, salt, enzymes), sodium phosphate. Contains milk. Packaged in a facility that also handles wheat, milk, soy, egg, sesame, peanuts, and tree nuts. 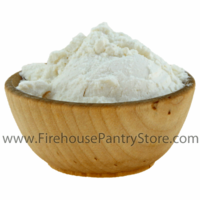 We use this in our Roma Romano Dip Mix.